Greetings to the readers of In the Playroom! My name is Liska. I come from Canada where my family lives in the picturesque region of grape vines and peach trees. 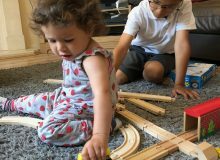 We love to create things: when my husband does not make historical armour, he helps me make wooden toys for our son. You can find the stories of our exploits, described in the blog Adventure in a Box. 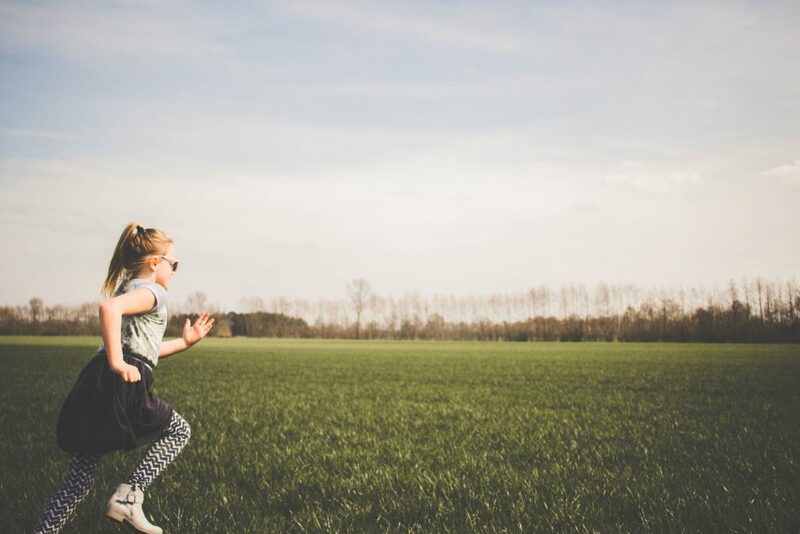 Anna kindly invited me to write a guest post, and I was happy to agree – she always inspires me with her descriptions of books, family trips and fun activities for children. I am proud to be making an addition to such a great resource. Our family has always been fond of theatrical entertainment. In the past, both my husband and I were involved in hobby theatres, and we still like sewing costumes and having dress-up parties. 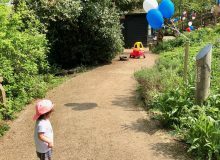 We have looked forward to sharing the excitement with our son, and as soon as he reached his first birthday, we started thinking of building a theatre. For now, a small shadow theatre. 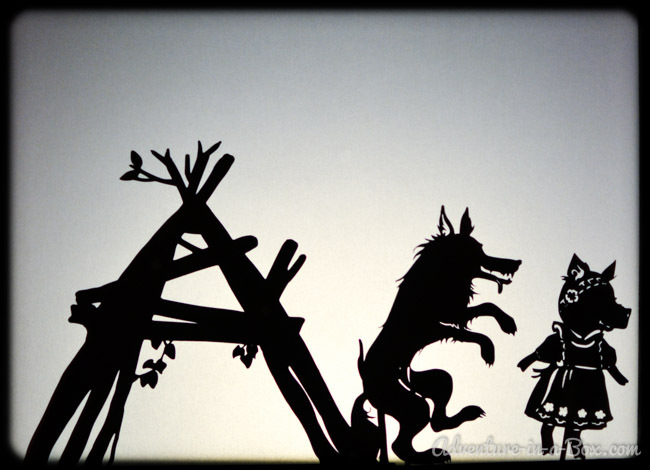 How to Build a Shadow Theatre? Easy, really. If you want to have a very small theatre to try it out, you can do with just a cereal box. 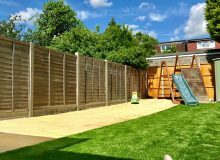 For a bigger one, a flat box from a baby gate or computer monitor could work. Cut a rectangle inside and paint the surface to your liking or leave it as it is. Then get a sheet of translucent vellum paper and stretch it tightly across the hole. A source of direct light is necessary, which a simple table lamp can provide when put behind the screen. Now wait until dark, and let the magic begin! 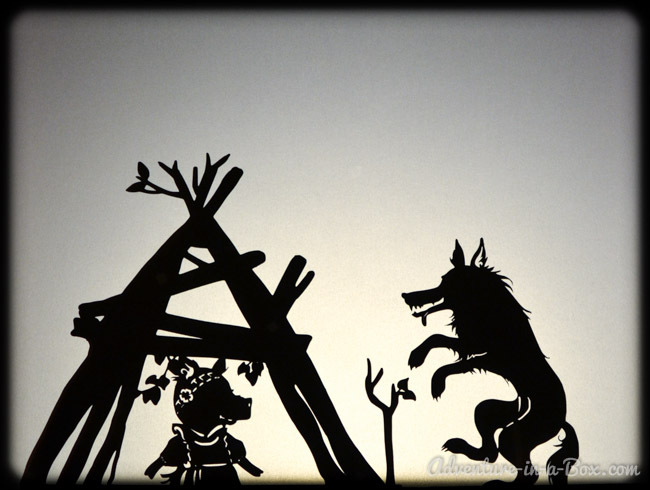 If you like shadow puppetry and want to build a sturdy theatre that will last for years, I invite you to check my step-by-step tutorial on how to build a wooden theatre with a minimum of materials. 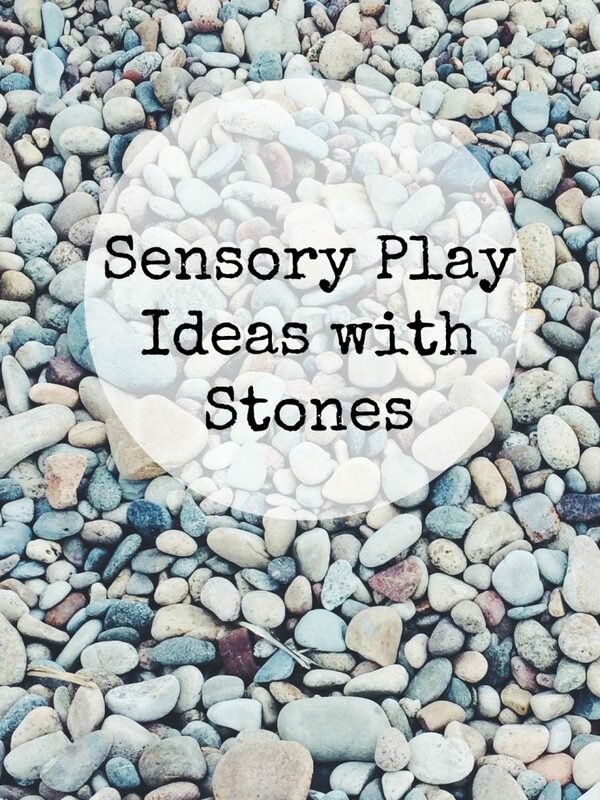 It is an ancient form of entertainment that is beneficial for children’s development. We also find it beautiful in an ethereal way. 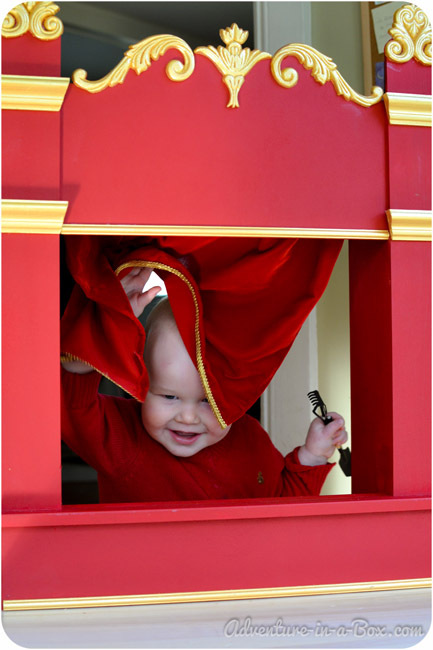 Children can enjoy shadow puppetry from infancy – even a three-month-old baby will be naturally attracted to high-contrast figures. 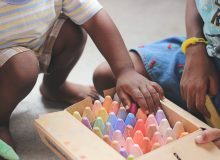 It is stimulating for their visual sense and develops their associative thinking when they recognize familiar objects in silhouettes. 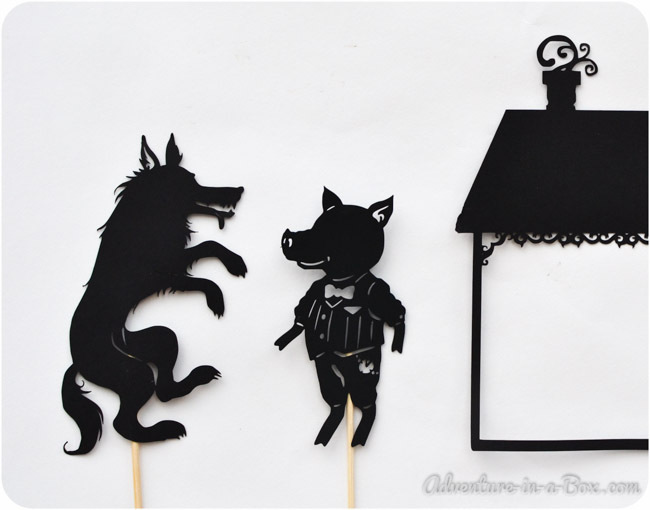 In no time, children will begin to show interest in stories, and a shadow theatre can make their favourite characters move and speak, further developing their fascination with literature along with imagination and creativity. 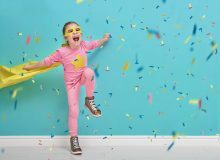 If children take pleasure in it, creating decorations and actors for a show can become an engaging family activity. This is what we have been doing for the last couple of months, and I would like to share our newest set of actors. 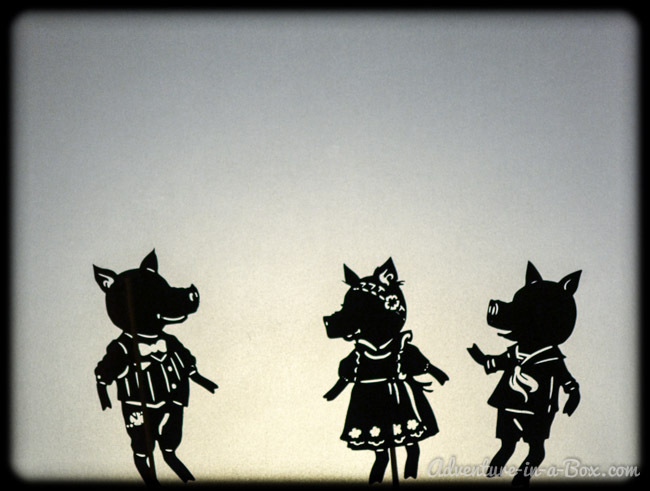 This week, on stage at our Theatre-on-the-Couch are Three Little Pigs! 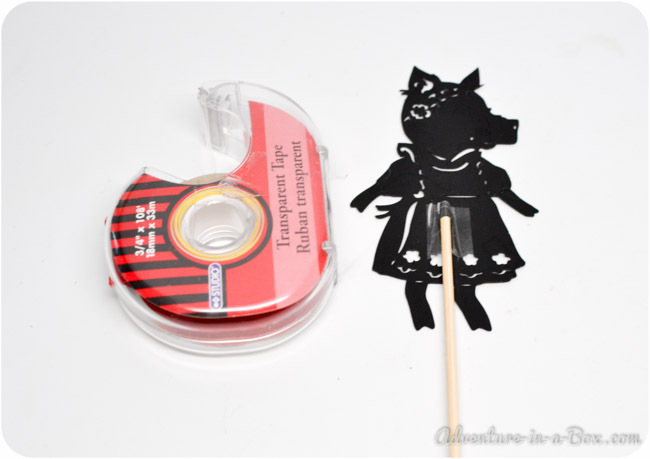 How to Make Shadow Puppets? 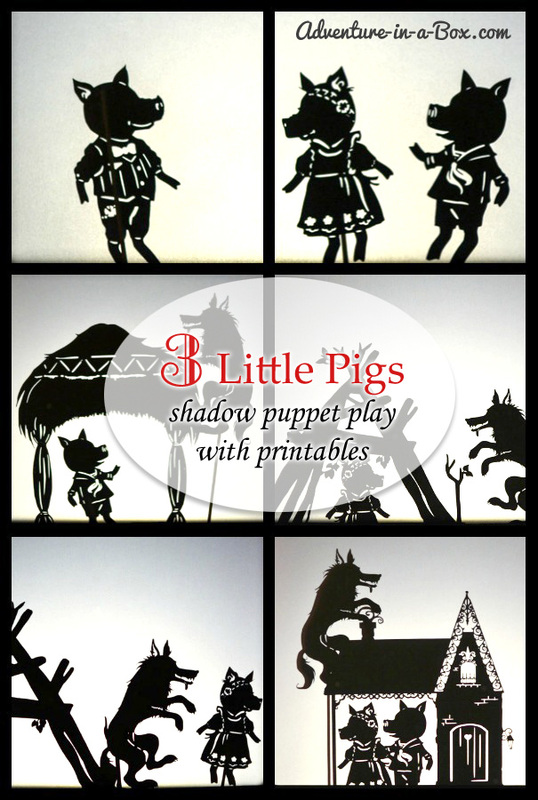 If you make shadow puppets from scratch, you will need black card stock. However, if you use our template, it would work best to print it out on a piece of thick white paper. For cutting the silhouettes out I recommend a hobby knife. Start with smaller cut-outs inside of the silhouette. Cut the outlines of characters last. When you are done, get bamboo skewers and tape them to one side of each puppet. It does not matter which side, since the bamboo stick will just show up as a shadow. Decorations, like houses and trees, do not have to become puppets because they will stay in place, and you will need both hands to manipulate your paper actors. I usually stick them to the screen with two-sided tape. When I thought of making three pigs, at first I felt fairly uninspired. Three pigs, after all. Three identical pigs! Or not necessarily? As soon as I decided to dress them, the project started to appeal to me more. When I thought of dressing them in Victorian costumes and making one of them into a girl, it really began to come together. In the end I had a lot of fun. As for the houses, I already had a brick one, left over from our Little Red Riding Hood show, along with the Big Bad Wolf. Poor Wolf, he does not find happiness anywhere… For the straw house, I had to look up references on thatched roofs, and it was an educational experience. The stick house was inspired by Native American wigwams. Before the performance, adults may need to refresh their memory about how the story goes. The Project Gutenberg has the full version of the story, however for our show I used the one I remembered from my childhood where none of the pigs get eaten. The first one runs to the second pig’s place, and then together they escape to the third pig’s house. Now the curtain goes up! 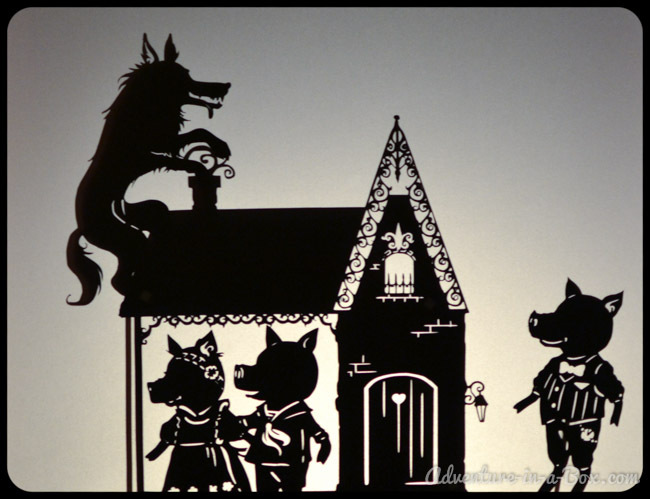 So the Wolf huffed and he puffed until he blew the house down, and the little Pig had to run away very fast. The Wolf could not destroy the last house because it was made of bricks and very sturdy. So he decided to climb into the house through the chimney. 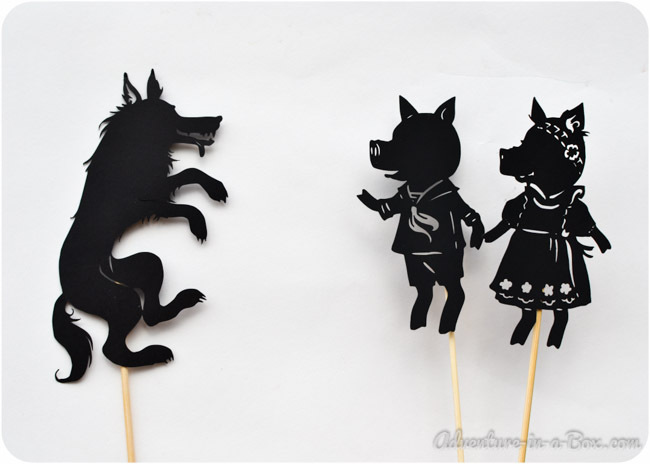 The pigs were making dinner, and the Wolf burnt his tail and ran away, howling. After that he did not try to follow three little pigs. They all built brick houses and lived happily ever after, visiting each other. If you want to stage this show at home, you can download the designs of characters here: These are printable files in PDF format. Thank you again for inviting me to write here, Anna, and thank you for reading, everyone! wow! that is fun! love to make one! Merlinda Little (@pixiedusk) recently posted…All out. This is SO neat! I am linking to this page of yours for an upcoming blog post of my own. I hope you enjoy some new visitors over your way! Lisa/SyncopatedMama recently posted…31 Days of Great Children’s Music: Schoolhouse Rock! They are fantastic – thanks for posting/sharing. 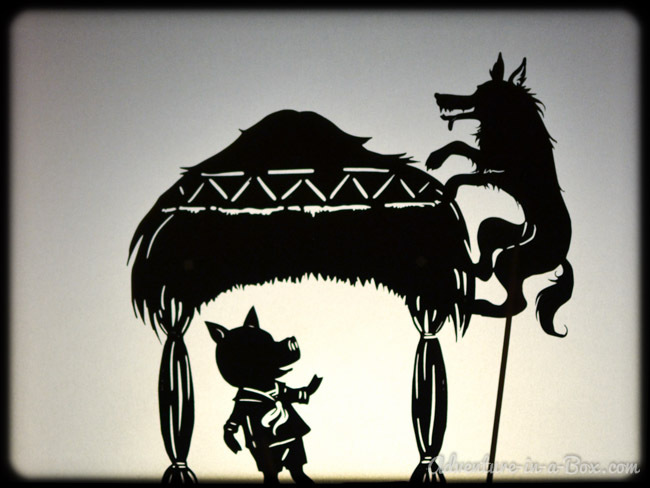 The work perfectly with my shoebox-shadow puppet theatre. how many persons this play need? can be play just one person?